Do you have a minute to spare to learn some English? Dan's going to demonstrate how to use infinitives of purpose! Give us 60 seconds and we'll give you the English! 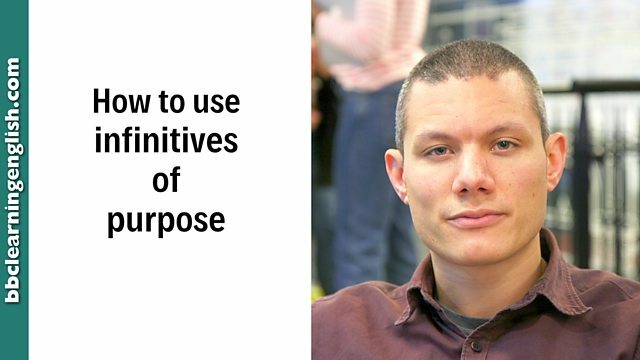 Hi, I’m Dan from BBC Learning English, and today I’m going to talk to you about infinitives of purpose. English has something called the infinitive of purpose. We use it to explain why we do something. To explain why we do something is an infinitive of purpose. Why do we use it? Another example is: I went home to eat. We make our sentence: I went home, and then attach a full infinitive verb – to eat. This doesn’t work with nouns. For example: I went home to food. To use a noun we use for. I went home for food. Finally, we can also use for to talk about doing something to help someone. For example: I made this video for you to learn. You’re welcome! English has different verb forms. A full infinitive is to + verb. For example, to eat. When a full infinitive is used at the end of a sentence to explain why we do something, it is called the infinitive of purpose. This only works with verbs, not nouns. I went home to eat. He's going to the gym to lose weight. I will work hard to make more money. To explain why we do something using a noun, we use for. I went home for food. He's going to the gym for exercise. I will work hard for money. We can also use for to talk about doing something to help someone. I made this video for you to learn. There's a cake on the table for you to eat. Do we use 'to' when we want to explain why using a noun? How to we explain that we are doing something to help someone? Complete this sentence: I bought those books ____________.